PLEASE WATCH AND SHARE THIS VIDEO!!! I am subscribed to this Youtube Channel for the political commentary. But when I seen the channel owner had posted this video and it looked like it was an inside scoop type situation into the types of abuses that happen at almost all Word of Faith churches, I knew I had to share this story here at this site to help get the word out of this ladies story. While I am currently pretty inattentive with the WoF exposure part of my ministry here at this site I just had to use this platform to help this lady out and to once again shine a light on the WoF Movement and once again tell THE WORD on the Word of Faith. Please share this post and this site to help get THE WORD out. UPDATE: I was sent a link to this video where Audrey Stevenson tells her story after the fact. Here is her commentary about the indecent. UPDATE 2: TD Jakes and Potters House issues and CYA apology. Guess what, some people are attacking Audrey and are telling her she is demon possessed. That is typical WoF abuse. This is so so outrageous. I am sure someone will be telling her she has fortified her salvation by “touching The Lords anointed”. I think she will end uo with a big check because she was severely abused both physically and spiritually. UPDATE 3: This is a commentary video by Letisha Brown, who hosted Audrey’s commentary video above on her channel. UPDATE 4: This video was put out Miss Brown yesterday. It is from Audrey before the violent incident at Potters House where she tells her story and testimony. This is some good stuff right here. I hope those at Potter House do not put out the fire for God in this young Christian’s heart. Please pray for Audrey. You cannot tell me that charismatic men like Dr Brown are not smart enough to use deductive reasoning to tell that when scripture says we will do greater works than Jesus, it should be interpreted in a quantitative and extent sense rather than a qualitative and power sense. Jesus’ earthly ministry had been largely limited to Galilee and Judea; His disciples, however, were going to extend His ministry to the uttermost parts of the earth. Jesus raised himself from the dead, any ohas good sense and anyone who studies their bible knows that no man but Jesus ever did that. These men that insist this passage means we will do greater miracles than Jesus are just deceived or deceived and deceivers. They are not that stupid, they are driven by the same pride that got the devil kicked out of heaven, the pride of wanting to be as like God. Kat Kerr is already responsible for the death and destruction from hurricane Harvey. If they could have stopped it why didn’t they? And now they are commanding hurricanes Irma, Jose and Katia to “stay away and dissipate”. Irma has already caused death and destruction in the Caribbeans. Kat Kerr and her crew are responsible for not stopping that death and destruction. Now they are claiming responsibility for hurricanes Irma, Jose and Katia. If these storms cause any misery, it is on them for not stopping the storms since they claim to be able to. If these storms cause damage we will also be able to say the Word of Faith teaching that Christians can control the weather with the power of words through the force of faith is hogwash. The belief that Christians can control storms is nothing more than witchcraft veiled in Christian terms. It is God, not Satan, who controls the weather (Exodus 9:29; Psalm 135:6-7; Jeremiah 10:13). God controls the skies and the rain (Psalm 77:16-19). God controls the wind (Mark 4:35-41; Jeremiah 51:16). God upholds and sustains the universe (Hebrews 1:3). God has power over the clouds (Job 37:11-12, 16). God has power over lightning (Psalm 18:14). God has power over all nature (Job 26). I realize these are desperate times but do you guys know that the teaching that men can control the weather with words has ALWAYS been taught in Witchcraft? It’s called “weather magic” or “weather witching” in occult circles. Likewise you will never find a single historical reference showing Christians commanding or rebuking storms before the rise of the Word of Faith Movement. Please listen to what these prominent Word of Faith teachers have said. They know the teaching of the Word of Faith movement is witchcraft veiled in Christian terms. Kat Kerr and her “weather warriors’ are already responsible for the death and destruction from hurricane Harvey. If they could have stopped it why didn’t they? And now they are commanding hurricanes Irma, Jose and Katia to “stay away and dissipate”. Irma has already caused death and destruction in the Caribbeans. Kat Kerr and her crew are responsible for not stopping that death and destruction. Now they are claiming responsibility for hurricanes Irma, Jose and Katia. If these storms cause any misery, it is on them for not stopping the storms since they claim to be able to. If these storms cause damage we will also be able to say the Word of Faith teaching that Christians can control the weather with the power of words through the force of faith is hogwash. The belief that Christians can control storms is nothing more than witchcraft veiled in Christian terms. God has power over lightning (Psalm 18:14). God has power over all nature (Job 26). In the aftermath of hurricane Harvey there is a tropical disturbance in the gulf right now that could turn into a tropical storm and hit Houston. There is a tropical storm in the Atlantic right now, Irma, that could hit Texas and Louisiana. I am publicly calling on Joel Osteen, Kenneth and Gloria Copeland, Creflo Dollar and all other Word of Faith teachers and believers – who thinks words have literal power and they can control the weather – to use your faith to kill this tropical disturbance and make it dissipate before it strengthens and makes landfall anywhere. Kill Irma in the Atlantic right now too. Both Texas and Louisiana are already inundated and cannot take on any more water. If this disturbance turns into a storm and causes more death and flooding, it is on ya’ll. It is on ya’ll. A Facebook Status from one of my FB friends. Harvey stayed in Houston another 48 hours despite this status and other Christians liking it and giving hearty Amens. WHY? In fact it is already on ya’ll. At least 14 people have died so far and so many have lost everything and millions have had their whole lives uprooted. If you have such great faith that your words have the power to control the weather why did you let all this happen when you could have used your great faith and powerful words to have stopped all this? Who among you Word of Faith believers have enough faith to step up and use your sovereignty over storms to save lives and to stop further destruction and ruin? If you’re Word of Faith theology is correct I am calling on you to step up and use your little-god-like powers right now and stop all this. You have already caused so much suffering. Who among you will be our savior? Answer me now, who among you have such great faith you can be the savior of the people in Texas and Louisiana? How about you O’ Word of Faith believer, are you our man or woman of great faith? How about the people who have taught you this witchcraft veiled in Christian terms? Can they step up “in unison” and in great faith command these storms and save us? SOURCE: Yes we know, he makes you feel good… and he’s sooo nice. But let’s be honest: he’s not good for you. 1. 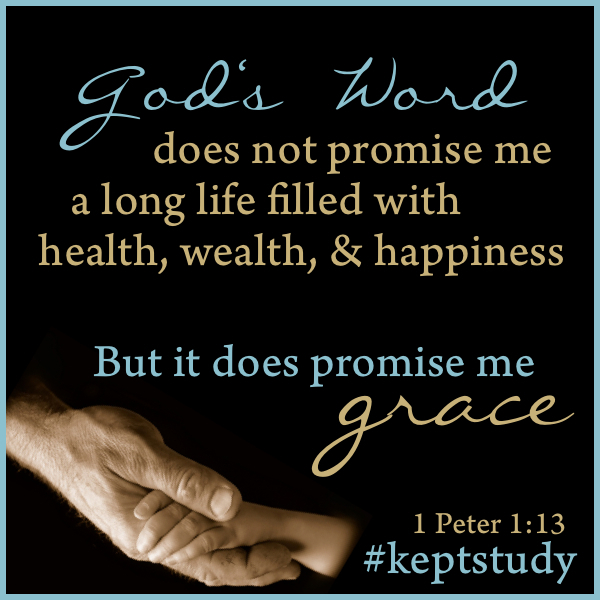 He takes Bible verses completely out of context and changes the meaning of God’s Word. A lot of times he only uses half a verse! This is not a mistake, girl-he’s doing it on purpose! No real man of God would ever do that. Ever! Anybody can hold up a Bible and wave it around, a real pastor dedicates himself to studying it, and then carefully and faithfully explaining it in context. A phony pastor uses it like a prop and pulls stuff out of it to make it say whatever he wants. 2. He tells you all the things you wanna hear, but they aren’t really true. He’s appealing to your selfish “felt needs,” because he doesn’t care enough to tell you the hard truth that would actually help you. He’s promising you all sorts of earthly comfort, prosperity and happiness, but those are empty promises-and you know it. He’s leading you on! 3. He isn’t giving you the really good news-the Gospel of Jesus Christ. You know, the message of repentance and the forgiveness of sins. He should be promising you the one thing a pastor can promise you: the free gift of salvation and eternal life through faith in Jesus Christ; but instead he’s puffing you up with false dreams of worldly success. You’re falling for that? Once he has ignored the true Gospel, he replaces it with the crazy “God wants to bless you, but He can’t-you have to do you’re part” teaching. Is he talking about the sovereign God who made the whole universe out of nothing, or is this a genie in a bottle who needs us to figure out the secret password?? 4. He’s getting rich off of you-that’s not what pastors are supposed to do! Now, it’s true that he’s getting rich mostly from his book sales and other income sources (he doesn’t need to take a salary from his church anymore), but without the huge audience he gained from his church and it’s TV program he never would have become so famous and sold so many books. He is not really helping others to be successful like he claims-unless they all go out and start mega-churches that have TV shows and big-time book publishing deals. He’s at the top of the pyramid! 5. He has become so huge in popularity and influence, that people think he represents true Christianity in America. You know that’s not right! He teaches a “Word of Faith” version of Christianity that doesn’t come from the Bible at all-it actually comes from Kenneth Hagin, who plagiarized E. W. Kenyon, and Kenyon was getting ideas from Phineas P. Quimby-the same guy whose non-Christian metaphysical ideas influenced Christian Science. 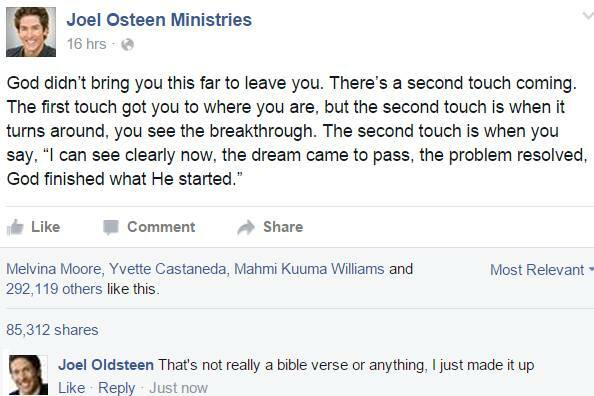 When Osteen says we can “speak things into existence” he’s talking about sorcery-not Christianity! 6. You’re falling for all that bling? Really?? A big fancy stadium, a TV Show, best-selling books… that doesn’t mean he’s telling you the truth! Are you gonna trust someone with your very soul, just because they’re rich and famous? Did you know that Joel Osteen only went to college to study radio and television communications-but he never even graduated? But worse than that, he never studied the Bible or theology at any Bible school, college or seminary-ever! He’s making it up as he goes! Real pastors are carefully trained in good doctrine-otherwise they end up saying things about God that aren’t true, and they lead people away from the true God! 7. He’s not gonna be there for you when you need him! 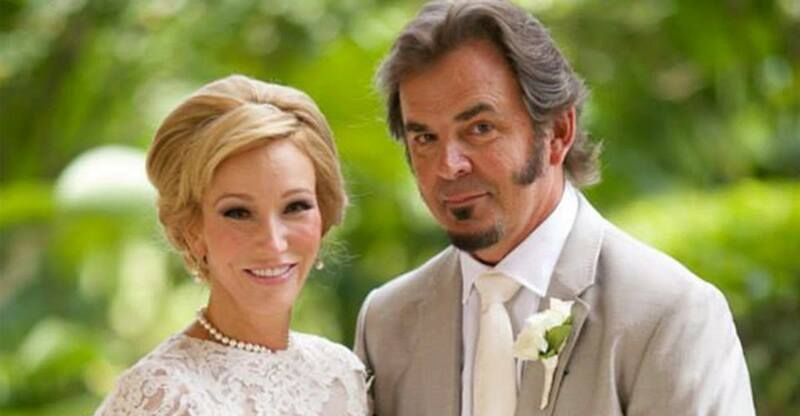 He’s not a real pastor, he’s a millionaire celebrity! A real pastor sits down with you and carefully explains God’s Word, week after week after week. This guy is flying around the world, hobnobbing with Oprah and who knows who. A real pastor takes care of his sheep-he doesn’t just go onstage and give a little motivational speech once a week. These mega-pastors are completely isolated from the “regular” folks-just like rock stars, big politicians and movie stars. 8. He’s setting a bad example of a Christian pastor, and you’re setting a bad example by following him. Most unbelievers can see that this guy is kind of a joke (or worse), but way too many gullible Christians are propping him up, and we should know better. Basically, having an unqualified, Bible-twisting, multi-millionaire celebrity described as a “pastor” is a very big embarrassment to the Church. If we are going to be credible followers of Christ, we should have credible pastors; pastors who will “contend earnestly for the faith” and who will “speak the things which are fitting for sound doctrine,” not a guy who scratches people’s itching ears and tells them what they want to hear. 9. Admit it-you like being part of something really really BIG! It’s one of the oldest tricks in the book: you’re with all those like-minded people and you get to say “I’m a part of something really important and exciting!” It’s like you’re at the Super Bowl or something. It’s no accident that these mega-churches have exciting rock bands with light shows and giant video screens-they are manipulating you until you can no longer resist. Get a grip! This guy will never even know you’re name-you’re just another seat filler. A real church with a real pastor is not like this. You deserve better! 10. Here’s a list of shocking things you’re not supposed to know; Joel Osteen will NOT mention these Bible verses because he’s not a real pastor. Break up with him, and find a real pastor at a real church. You will be so glad to hear the true Gospel of Jesus Christ! For years I hear about this documentary film but have never seen it. It was very informative but also very sad and heart-wrenching. 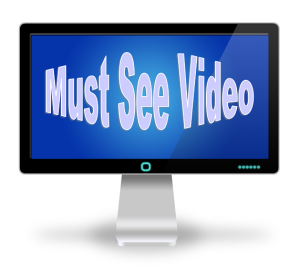 If you have lost someone who died from Word of Faith teachings, like I have, this will be very emotional for you to watch. But it is an excellent expose piece that should be shared far and wide. Please share this!!! (H/T to C.T. Jermin) — Brian Carn’s 2014 NYE prophecy for the Year 2015 is exactly the same as this psychic Cheryl Lynn’s 2015 predictions back in February 2014. 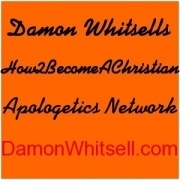 Chris Rosebrough of Pirate Christian Radio ends his look at Jesse Duplantis’ cultic teachings of the Health and Wealth “Gospel” saying that Jesse is not on “team Jesus’ side.” Funny. Pirate Christian Radio focuses on Robert Morris’ false teaching on the gifts of the Holy Spirit. 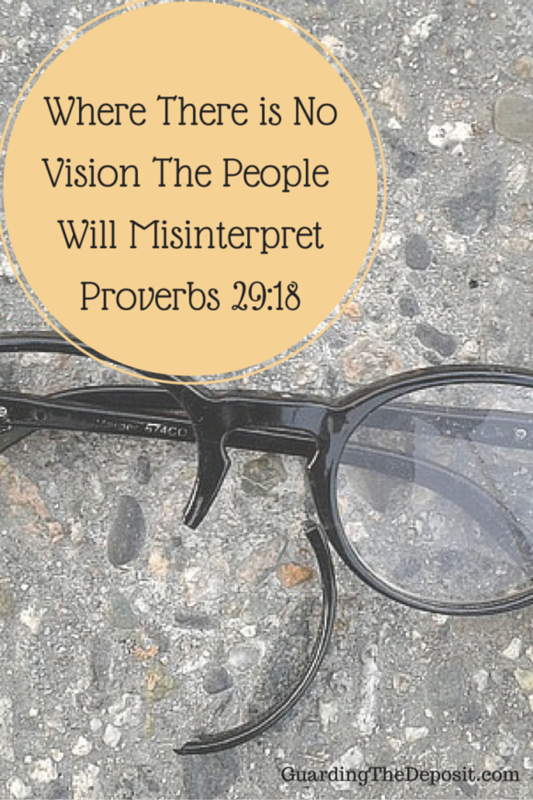 Enjoy the correcting power of Scripture as Chris Rosebrough looks Biblically at the issue. Suppose your daughter walked up to you with a concerned look on her face, and started telling you about being really scared of certain kids at school who were known for bullying others. What if your response to her was “Scared? Don’t you know that fear is not supposed to play any role in a Christian’s life? By giving way to fear you are only inviting the devil to exacerbate the problem. 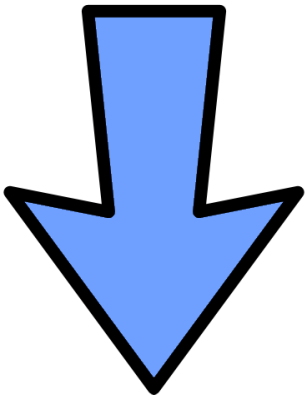 Why be so negative? Banish fear in your life and start talking about how confident you are! Have more faith in God!” How effective do you suppose that “advice” would be in your daughter’s life? Further suppose your daughter started complaining about some recurring pain she was experiencing in her abdomen. What if your response was “Don’t talk about pain, only confess how blessed you are by God! By talking repeatedly about your pain you are setting a law into motion – -what you talk about becomes reality. Talk about how good and healthy you feel — then your external circumstances will start lining up with your words!” How effective do you think such “motherly” advice would be? Personally I think that most level-headed Christians, and just plain folks in general, would feel like nominating that mother for a “worst mother of the year” award. Bullying is a major problem in many of our schools, and it takes a concerted effort by students, teachers, and parents to put a stop to it. Teen suicides have often been linked to being bullied. Repeated pain in the abdomen could well be a serious indicator of appendicitis or something much worse; a trip to the doctor is in order. Unfortunately, however, there are quite a few Christians who have fallen prey to this strange teaching that we create our own physical reality by the words we speak. Supposedly if we only speak “positive” words, then “positive” things will happen to us, and conversely, if we speak “negative” words, then “negative” things will happen to us. This, many are told, is what “faith” consists of — it is taught in certain churches right here in the Columbia area. It would be laughable if it were not for the fact that I have seen a lot of intelligent, devout Christian folks fall for it. It certainly is not traditional, orthodox Christian faith — if one could only step back in time a few decades prior in history and run that “teaching” by Christians back then, it would be met with shocked looks of incredulity. There is also nothing laughable about children being invalidated by ignoring their genuine concerns, fears, and health problems in the name of “having a positive confession.” It is more akin to folk magic beliefs in third world countries rather than the historic Christian faith. Supposedly this is the same way God looks at us — we should only be speaking wonderful, positive things and never say anything that reveals our momentary fears, depression, pain, sufferings, etc. Isn’t it interesting that King David, one of the most revered Biblical heroes of the Old Testament, penned such psalms as “How long must I wrestle with my thoughts, and every day have sorrow in my heart?” (Psalms 13:2). How about “O Lord, how many are my foes! How many rise up against me!” (Psalms 3:1). Then there is that classic line “My God, my God, why have you forsaken me?” (Psalms 22:1). That thought was quoted by our Savior Jesus Christ hanging on the cross — oh my, the “negativity” of it all! An important point to remember is that these Psalms were ancient Israel’s hymnbook. It is what they used in their worship. In times of national distress they would sing these “negative” Psalms in their worship to God, fully expressing the depths of their misery. They knew that God was a loving father and would hear them in their distress. God wouldn’t browbeat them for expressing the fact of their misery. SOURCE: If you believe with all of your heart and soul that you deserve success — and by success, I mean financial reward alongside the accompanying emotional transactions encountered in the process — then it shall come. I have foreseen this; I know it to be true. 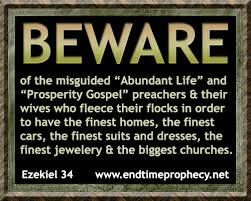 The prosperity gospel is nothing new, nor is the train of thought guiding it limited to followers of Christ. Preachers like Joel Osteen and Creflo Dollar unabashedly preach such fortune: Your faith is measured by your success; by your beliefs shall you prosper. It’s a seductive notion, one inspiring millions of people, given the popularity of Osteen’s varied industries and Dollar’s widespread congregation, among many others. Predating Osteen by nearly two centuries was Phineas Quimby, a mesmerist and healer born in New Hampshire in 1802. As the inspiration behind what would become known as New Thought, his philosophical system taught that God, or Infinite Intelligence, is everywhere — human beings being the major beneficiaries of such awesome divine power. Quimby wasn’t a doctor but he played one often: Sickness was the result of wrong thought, in some way implying you were responsible for your ailments — an unfortunate belief persistent in both Christian groups and New Age movements today. She also denied any relationship to Spiritualism, a popular movement that claimed contact with the spirit world (even though the sisters who kicked off the movement later admitted it was a farce). Eddy’s preferred term was “malicious animal magnetism,” her fancying that people harm others through their “mental powers.” If the psychic hotline between divine and human was open, humans could travel along the same network to damage other sentient beings, which fits in nicely with the prosperity model: an unseen force checking your name off the list if you misbehave, favoring your bank account when your faith is strong. New Thought was founded by Emma Curtis Hopkins, a former student of Eddy mostly inspired by Quimby. With roots in the 1880s, national conventions were followed by an international conference in 1914; by the ’40s there were 18 distinct schools based on New Thought’s foundation. The major focus of these schools included the development of one’s will power, the burgeoning self-help market, and, yes, financial success. 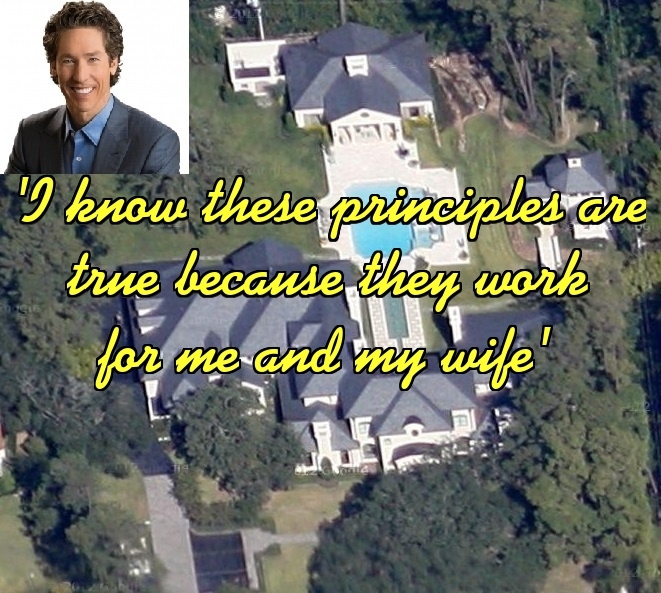 Osteen, who some claim helped create the housing crash due to his advice that God will provide the resources for his congregant’s new homes, had no problem buying his own $10.5 million mansion in 2010. 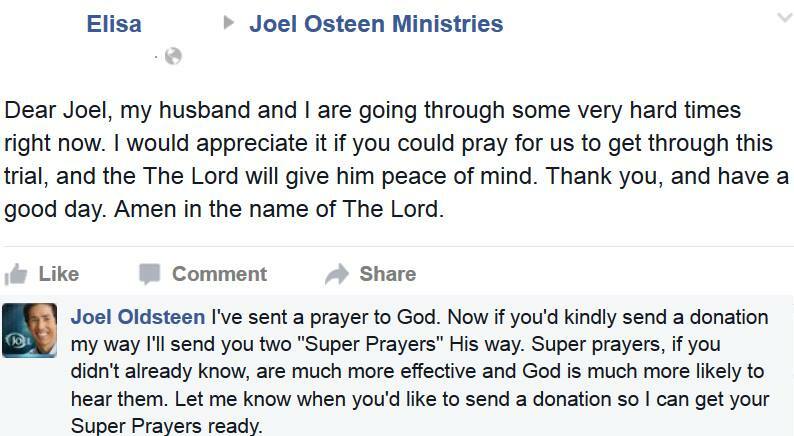 Osteen reportedly accepts no money from his church. His real cash cow is book sales, which, as quoted above, ensure people the Big Guy is on their side — and in their wallets. Oddly he didn’t mention good cars, for his fleet of 93 Rolls Royces was a certain measure of his divine favor. The philosophy of prosperity certainly seems to be an American creation. 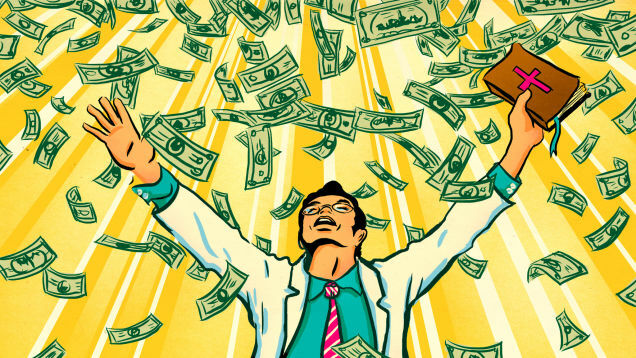 While other cultures have exploited its population under the guise of religious pretensions, the idea that infinite riches is available for everybody with a mind to believe, promoted by those who do indeed enjoy such wealth, is an old scheme that shows no sign of slowing. It’s like the lottery of religious lingo: Everyone has a shot, but really, only the ones calling the shots. 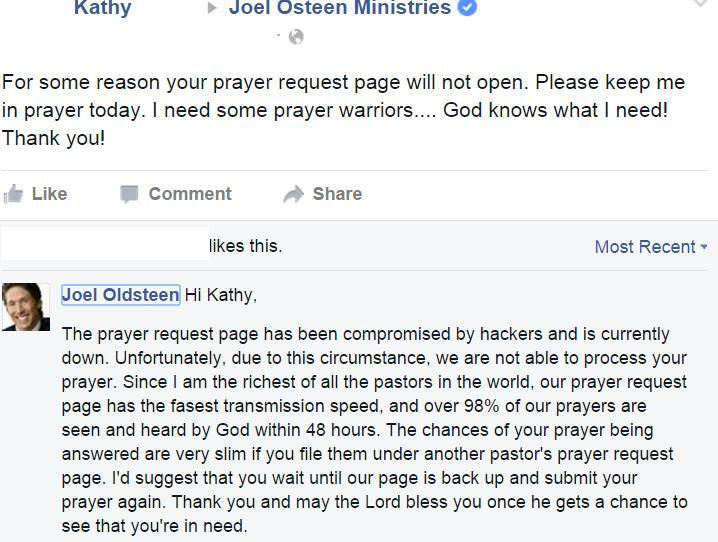 SOURCE: After lasting long enough to gain notoriety, comments on Joel Osteen Ministries’ Facebook page from a parody account known as “Joel Oldsteen Ministries” have stopped. 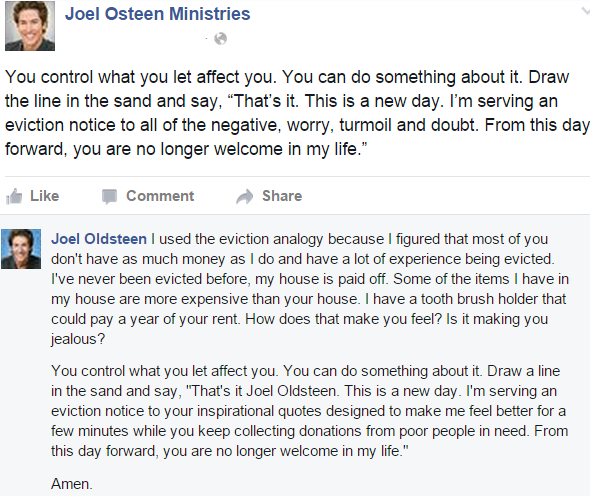 Posts can still be seen on the Facebook page for comedian Ben Palmer, the inspiration behind Joel Oldsteen Ministries. In addition to being flagrantly irreverent, the Oldsteen comments are absurd. Asked for a comment about the fake account, a Lakewood Church spokeswoman said it comes with the territory of having a lot of Facebook fans. With nearly 12 million “likes,” Joel Osteen Ministries has a huge following that’s bigger than Oprah Winfrey’s 10.8 million, for example, but nowhere near Cristiano Ronaldo’s 103.6 million, according to CNBC. The idea of Osteen smashing a Bible on stage or biting “a rat’s head off like Ozzie Osbourne” is wildly at odds with his homespun image and constant smile. 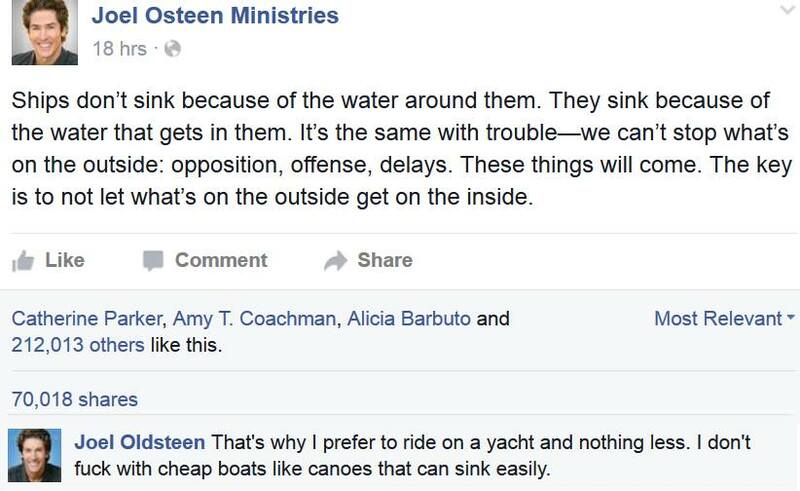 Most of the fake posts have a financial theme, depicting the pastor as overly interested in money. Although he stopped drawing a salary from the church in 2005, his net worth is estimated at $40 million, according to Celebrity Net Worth. His books and related items generate about $55 million per year, the website states. In response to a question from “Linda” about giving to the poor, “Oldsteen” says poor people will be fine if they buy his book “I Am” for $16.22. “For example, after they purchase they book, the could say ‘I am’ and then finish it with, ‘Out 16 dollars,’ ” Oldsteen stated in his response. 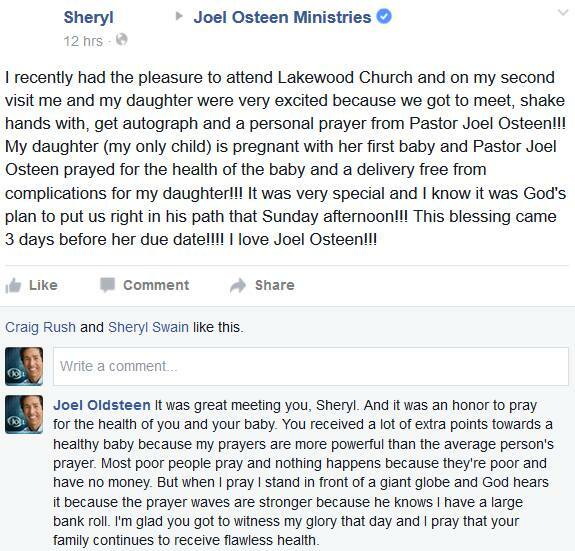 It’s unclear when Oldsteen started trolling the pastor of Houston’s Lakewood Church, the largest church in the United States, according to the church’s website, which cites Church Growth Today. 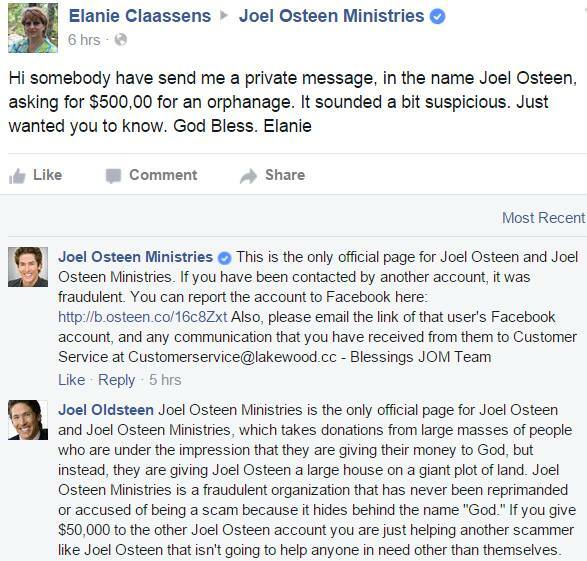 Joel Osteen Ministries responded by thanking the tipster for informing them about the fraudulent account. The humor website someecards.com also did a write-up about the fake posts and listed eight of them. SOURCE: No matter what I say, somebody is going to be mad because people take their movies seriously. Try pointing out that the third season of Star Trek is pretty bad at a fan convention. They might agree, but the justifications will begin. How do I know? I have made the excuses. There is good to be found, if you are fan, even in Spock’s Brain. O.K. No. There is not. We justify what we want to enjoy even when we should not. War Room isn’t a good movie. I hate to say that War Room is not a good movie because I want to encourage Christians to make movies. The movie isn’t very well made, the acting is marginal, and the writing is wretched. Nobody talks like the characters in the film and the plot holes are very great. Trust me. If you steal drugs and money for your stash, you will go to jail. War Room is a film that allows African-Americans a voice. That is a good thing, but a bad thing is that voice given To these characters is so sanitized and homogenized. This movie plays it so safe with the audience it hopes to lure that it betrays any authenticity. If you enjoyed the film, I am not saying you are wrong to enjoy it. Enjoy. Yet know this: the fact that so many Christian films are wretched, overly written, and full of religious jargon is harming this generation. Do you want to know one reason for people leaving the church? We have made wretched pop culture and called it Christian. We have taught lies and called them good theology. 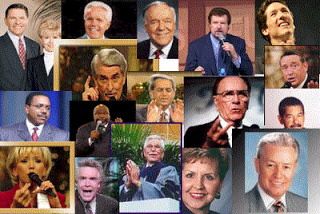 We have tolerated television preachers that shamed the cause of Christ such as Robert Tilton or Benny Hinn. I have a high tolerance for bad pop culture: I watched all of the third season of Star Trek and enjoyed it. I love the Hallmark Channel and I can watch any Christmas film. The problem is not that cheesy is not sometimes fun (go watch Birdemic), but that cheese is almost all we have done. Nobody has to go to the multiplex to see Andrei Rublev every time. Sometimes we want some fun (Avengers!) or a date film (Notebook) and they don’t have to be great. I will watch any version of A Christmas Carol with you anytime. When War Room is one of the better films in the genre, we are bloated on cheese . . . and it is American cheese not the real cheese. I know some movies in the multiplex mock what we hold dear, destroy the values of the nation, and call evil good. We are tempted to love anyone who says they love us. But films like these are worse than honest hatred, because they are dishonest love. They tell lies about reality, God, and our own experience. And yet . . . O.K. Perhaps things will get better. War Room is better made than earlier films from these producers. As I have suggested in the past, we can be patient while our younger filmmakers learn. We don’t want our criticism to cut off their experiments . . . as anybody who has ever taught student filmmakers knows. Nobody runs up to a student preacher and crushes him. Instead, we encourage and hope. War Room is not a student film. . . Facing the Giants maybe, but this is part of a series that all contain the same basic error. These filmmakers have had some time. They have made multiple films and the chief problem, the real danger, has not improved. The message of the movie is scary. The problem with War Room is that the Christianity isn’t really Christianity. Somebody is going to say: “Movies cannot contain an entire theology.” This is true. It need not. The difficulty is that all these films make the same mistake. They worship Genie Jesus: not the real Jesus. Here is a basic fact: Christianity is a religion of the Cross. We take up our cross daily and follow Jesus. Prayers are the work of the soul and all our prayers are answered, but some are answered “not yet” or with continued pain. God sits in the Heavens and governs the universe. He desires what is best for me . . . but also for every being in the cosmos. I cannot always have my way in the short term in a broken universe. SOURCE: If you do not know the Kendrick brothers by name, you almost certainly know them by their films: Flywheel (2003), Facing the Giants (2006), Fireproof (2008), and Courageous (2011). 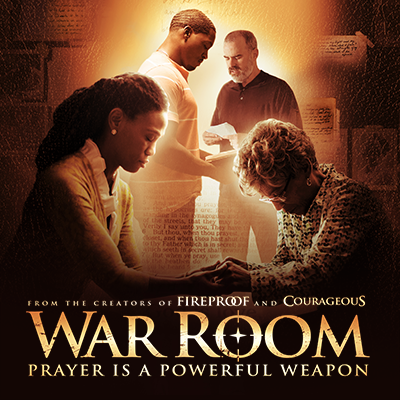 Stephen, Alex, and Shannon Kendrick have just released their fifth faith-based film, War Room. War Room, starring popular Bible teachers Priscilla Shirer and Beth Moore, looks like it may well be the most successful of their films to date bringing in $11 million just on its opening weekend; more than triple it’s $3 million production budget. 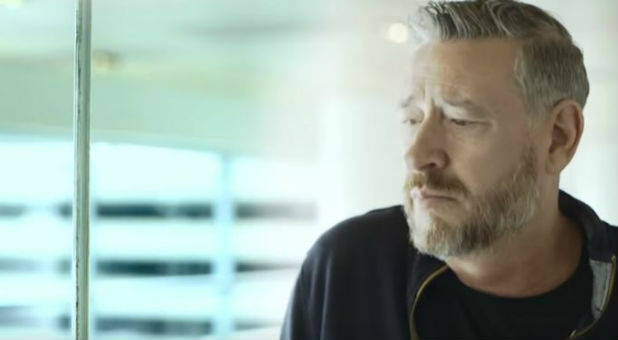 Keith Moore tells about his trip to heaven where “the Lord took him to see his dad” that had passed about 3 weeks before. My question is why does the Lord not do this for everyone to help them over their grief,, why for Keith and not others. Oh, you have to be a word of faith teachers and a “man of God” for that. Please watch Justin Peters’s warning about people who say they have visits to heaven before you watch Moore’s testimony.